Meghalaya Chief Minister Conrad K Sangma on Monday said the by-election to Ampati Constituency is important for the people, as this will recreate a roadmap for Ampati. He ridiculed the Congress for their claims that Mukul Sangma has given time to NPP and its partners to run the government for six months. “Congress has no number to form the government. Whether they win or loss they have nothing to gain from this election. Mukul is trying to satisfy his ego by fielding his daughter Miami D Shira,” Conrad said while clarifying the confusion created by the Congress. 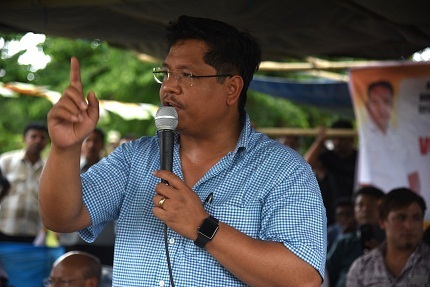 Urging the people to consciously vote for their chosen candidate, Conrad Sangma asked Mukul Sangma and Congress party to respond as to what gave them a reason to believe that NPP and its coalition government will not last. “Clement G Momin is the consensus candidate of MDA and there should be no confusion to believe that this Government will not last. We are all united and we will be there for the people of Meghalaya for the next 25 years,” he added. Deputy Chief Minister Prestone Tynsong termed Mukul Sangma as an ungrateful leader and sought people’s support to choose NPP candidate. “Ampati is a prestigious constituency, where Mukul Sangma started his political career but this leader of yours’ is ungrateful as after winning both Ampati and Songsak he decided to leave Ampati. So friends give a befitting reply to him in the upcoming by-election,” Tynsong said. Tynsong said that Congress is a broken party and always keeps fighting within itself. “I and Sniawbhalang Dhar resigned from the Congress because of the infighting in the party right from Delhi to the State level committee,” he added. Nagaland State President of NPP Ato Yeptomi and General Secretary Sashank Gataraj also addressed the rallies.